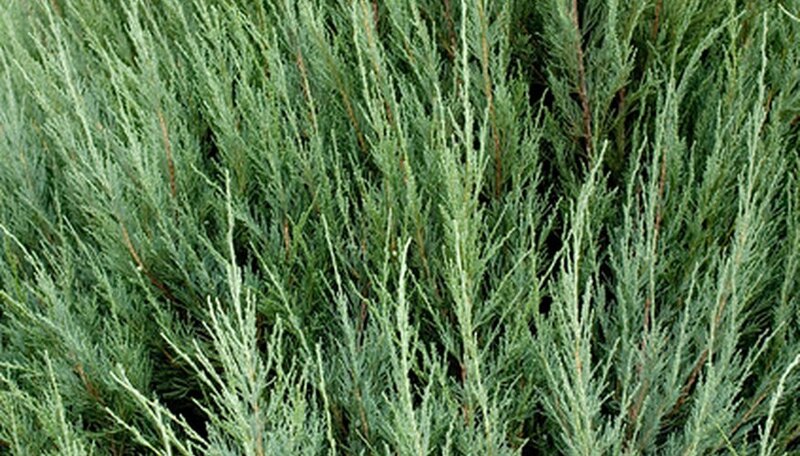 The thuja green giant is a vigorously growing member of the cypress family. This large evergreen grows about 2 inches per growing season, and can easily reach mature heights of 60 feet in 30 years. The tree is commonly used for privacy screening and wind breakers because of its dense, rich green foliage. Thuja giants adapt well to all types of soil variations and quickly adjust to pruning. Though adaptable, these trees sometimes encounter problems that can be damaging if not treated. Spider mites commonly attack the thuja. These multi-legged pests are especially attracted to the cool temperatures found in the dense foliage of the thuja tree. Spider mites lay their eggs in the late fall; they lie dormant throughout the winter months. Their red eggs hatch in the spring and quickly infest the thuja. Spider mites feed on the foliage of the thuja to cause a bleached appearance of the needles and twigs. These mites also create a series of silk-like spider webs that are especially present in infested thuja trees. Spider mite infestations can be controlled by hosing the tree with a high-powered hose. Insecticidal soaps and horticultural oils are also effective in controlling and preventing these infestations. Canker is a wood-rotting disease that infects the tree through wounds and natural openings. Canker diseases are usually caused by a fungus, but can also be caused by bacterial pathogens. Cankera develop on dead, defoliated debris that lies around the tree from spores that are moved by wind and rain. Infected thuja trees develop cankers around the trunk of the tree, as well as on branches and twigs. Cankers slowly grow around the woody area in an attempt to girdle the tree. Prevent canker diseases by removing the fallen debris around the tree to prevent germination of the infectious spores. Infected areas of the thuja should be pruned to control the disease. Winter injury has detrimental effects on the thuja giant. A combination of low temperatures, and drying and cracking that cause breakage affects the plant well into spring. North-facing thuja trees frequently suffer from winter injury because they are unable to harden off before temperatures drop, Cornell University explains. Thuja trees that are not properly watered and fertilized are susceptible to winter injury. While you can't protect the outdoor thuja from all aspects of harsh winter weather, winter injury can be controlled by maintaining a vigorously growing tree with a well-planned fertilization schedule. Fertilizer applications should end well before the onset of winter to allow the tree ample time to harden off new growth before the temperature drops. Generous watering and mulching in the fall also reduces the potential of winter injury. Damaged areas should be pruned in the early spring, just before the growing season begins.